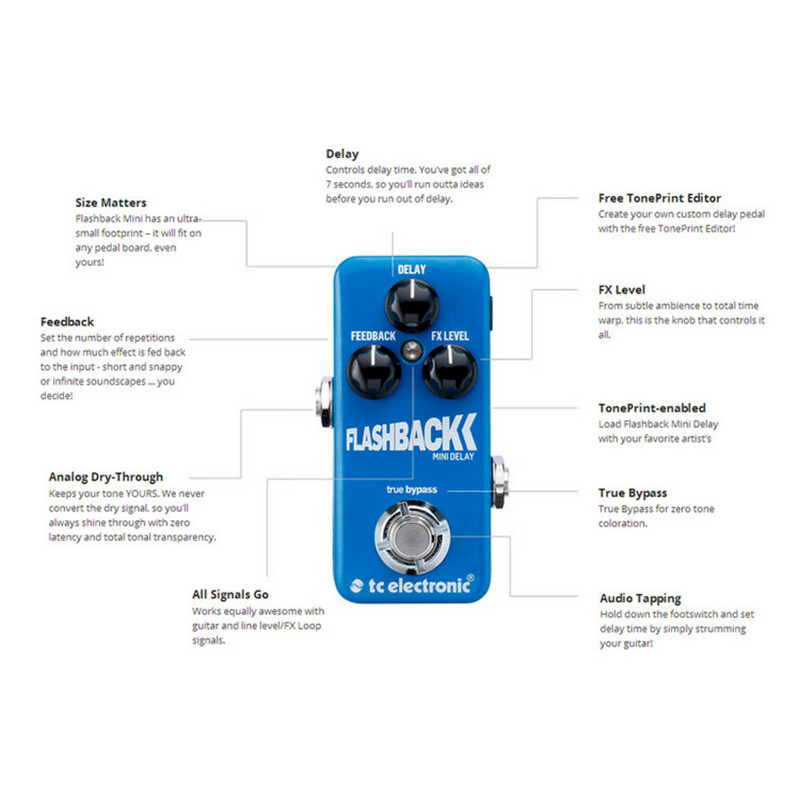 The TC Electronic Flashback Mini Delay Pedal takes everything guitarists know and love about the TC delay sounds and pours it into a super space saving case. Add to this, TonePrint Signature effects and you have a huge choice of delay types to play with. With optimised headroom, True Bypass or Buffered Bypass switch and Kill-Dry on/off, this pedal guarantees optimal tonal integrity and zero loss of tone. No matter if the pedal is on or off your dry sound is always passed through the pedal unharmed in all it's pure analog glory due to an Analog-Dry-Through. TC Electronic say they've squeezed in more magic per square inch to this tiny pedal than you'd find in a smurf! 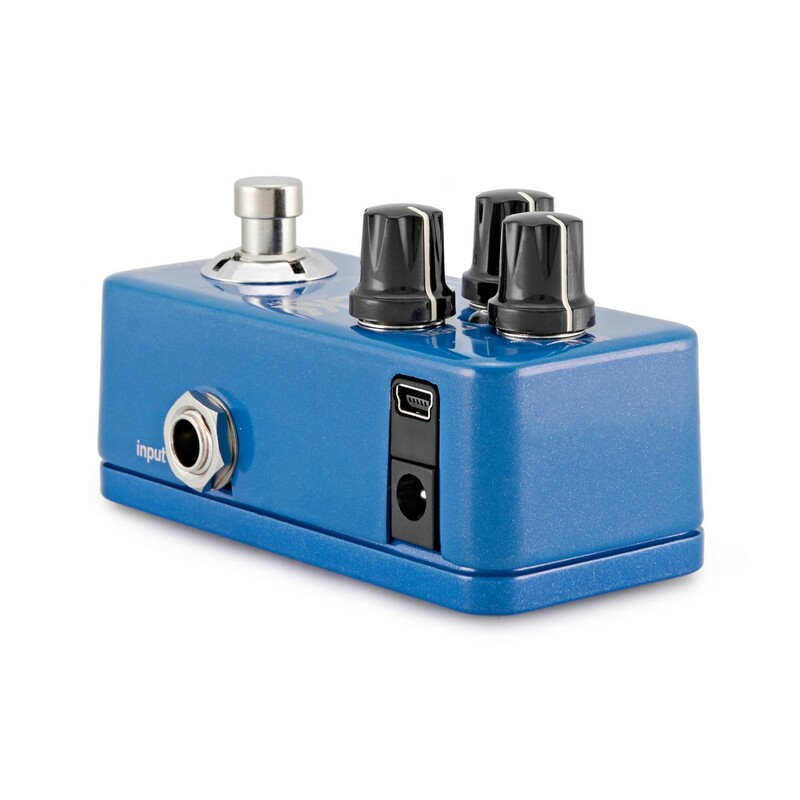 This pedal fits comfortably in the palm of your hand saving you valuable space on your pedal board. This small body still houses some of the world's greatest delay sounds as standard and features full TonePrint functionality. TC Electronic have teamed up with some of the biggest names in rock to customise a series of Signature delay tones for you to explore - free of charge. TonePrint means you can cram a ton of great delay tones into this compact pedal from tape analog, through the classic 2290 sound to dynamic delay. You can use the TonePrint Editor to get full control over all effect behaviour. Check out the full list of TonePrint artists here. TonePrint enabled - load Flashback Mini Delay with your favourite artist's tone. Free TonePrint Editor - create your own custom delay pedal. 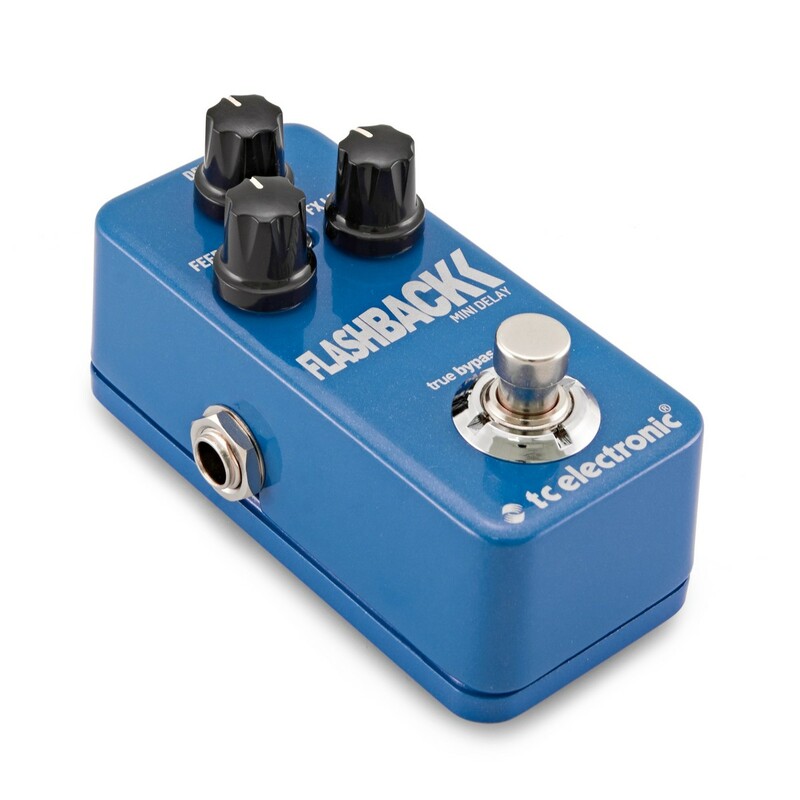 Beam enabled - send TonePrints to Flashback Mini through the free TonePrint app for iPhone and Android. Room for choice - select between renowned delays including tape, analog, 2290 and dynamic delay. True-To-Tone: True Bypass and Analog-Dry-Through. 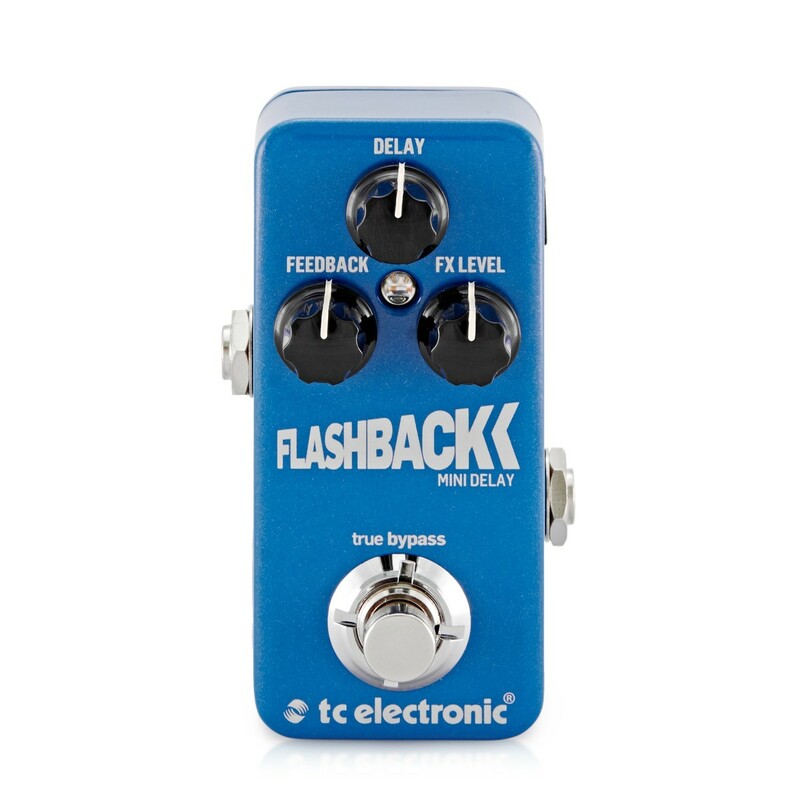 Put it in front of your amp or in the loop, Flashback Mini is equally awesome! Size Matters: Just look at it. Who'd have thought such a tiny pedal houses such classic and classy delay sounds? TC have made it happen, and your ears and pedal board will be grateful. TonePrint - Signature Effects: Flashback Mini Delay is TonePrint enabled. This means you get the revered TC sound multiplied to infinity with rockstar-customised versions of the best delays TC has to offer - free of charge! Room For Choice: An added benefit of TonePrint is that TC can cram as many delay types into this little miracle as your heart desires. From tape, analog, the classic 2290 sound and dynamic delay - it's all here in spades! Delay: Controls delay time. You've got all of 7 seconds, so you'll run out of ideas before you run out of delay. Feedback: Set the number of repetitions and how much effect is fed back to the input - short and snappy or infinite soundscapes. You decide! FX Level: From subtle ambience to total time warp, this is the knob that controls it all. TonePrint-enabled: Load Flashback Mini Delay with your favourite artist's tones. Free TonePrint Editor: Create your own custom delay pedal with the free TonePrint editor! 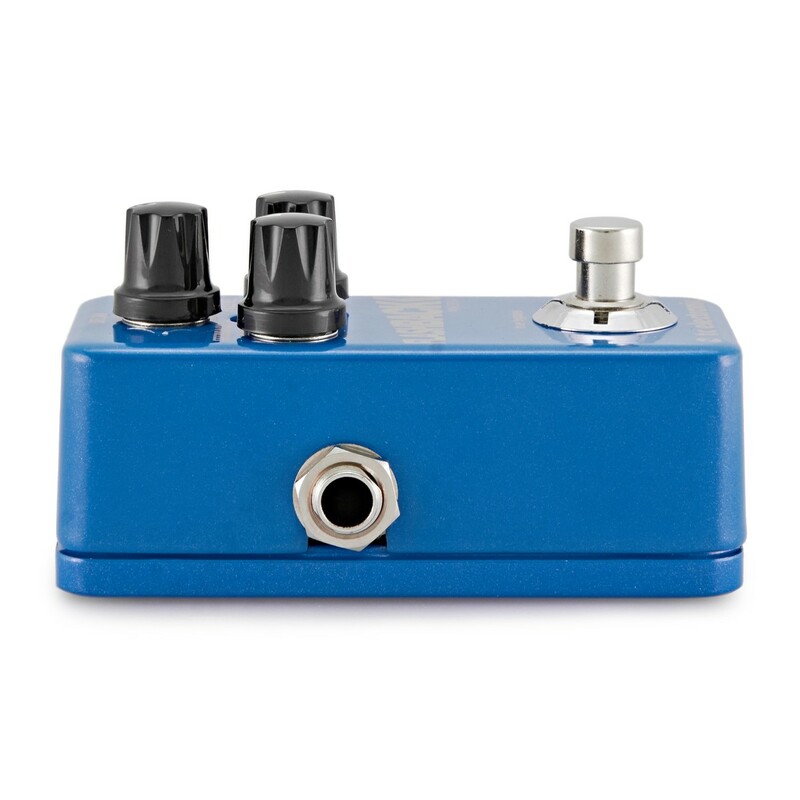 Size Matters: Flashback Mini Delay has an ultra-small footprint - it will fit on any pedal board, even yours! True Bypass: True Bypass for zero tone colouration. Analog-Dry-Through Design: Keeps your tone yours. Never converts the dry signal, so you'll always shine through with zero latency and total tonal transparency. All Signals Go: Works flawlessly with guitar and line level/FX Loop signals.